Is Behavior Based Safety The Safety Equivalent of Lobotomies? Edison wasted so much time trying to discredit alternating current that he missed out on potentially making more remarkable discoveries. Last week I posted another criticism of Behavior Based Safety (BBS) and was deluged with another predictable wave of “you don’t know what you’re talking about” emails and a fair number of positive comments. One comment that was sort of in between: “I have never been a big fan of BBS but I think you are guilty of doing something similar to what you accuse its proponents of doing – making claims without research or statistics to back it up.” I think that is a fair challenge to make, but I can assure you of two things: 1) I don’t make up research or claims that cannot be supported by research. There are already too many things on the internet that some crackpot made up and promulgated for one dubious purpose or another; and 2) I am not writing a research paper here. A blog is an opinion piece, so while I may reference research in a vague way don’t look for me to post a bibliography at the end of my posts. Rest assured I do not claim as my own, ideas and research that are the intellectual property of another, but you can write your own damned term papers. I will always make it a point to identify things that are my opinions from that which is the work or opinions of another. I have around 35 peer-reviewed i.e. works that are acceptable as a source that can be cited in academic works, and links are provided for those works so those of you wishing to use my work as a source should reference those works. So in the interest of citing my sources, I am reading Blunder, Why Smart People Make Bad Decisions by Zachary Shore and his views and research on the factors that influence human decision making and resultant behavior have profound implications for worker safety and (in my opinion) create a scathing indictment of BBS at a foundational level. Let me begin by stating that my principal concerns with BBS lie less with the methodology and tools than it does with the fanatical devotion BBS proponents tend to exhibit to the approach and their unwillingness to address any of the BBS weaknesses (accept to say that either the organization in question was misapplying BBS, or to add more complexity to an already unduly concept system. So why cling to something that is increasingly suspect? Dr. Shore begins his book with the story of Thomas Edison. You may remember Thomas Edison as the inventor of the phonograph, the light bulb, and a host of other inventions that literally changed the world. Some of you may also be aware of Edison’s personal campaign against alternating current (AC) as the best way to get electrical power to the places people needed it most. Edison worked hard to discredit the work of his one-time protégé Nikola Tesla. Despite overwhelming evidence that AC power was far superior, Edison sought to discredit it and Tesla. (Tesla didn’t help his case much by being a nutcase in his own right). Edison wasted time, money, and resources battling a competitive approach—instead of inventing new and exciting tools, Edison focused his energy (no pun intended) on destroying someone else’s work. I suppose one could argue that this is what I do when I criticize BBS, but I don’t want to destroy it, rather fix the gaping holes endemic to it. 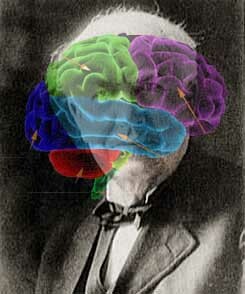 Shore uses Edison to illustrate a cognitive trap. Edison was so convinced in the “rightness” of his beliefs that he spent an inordinate amount of effort to destroy any competitive theory. I think there is a lot of this in BBS. One of the most intriguing ideas that Shore explores is the idea of causefusion, the act of attributing causation to instances where there is only correlation. In other words oversimplifying research that shows correlation to demonstrate (erroneously) causation. Shore uses, numerous examples, but points to the fact that nutritionists will find a correlation between eating a particular food and extrapolating that a nutrient contained in high concentrations in a food would have the same effect in supplement form. For example, eating foods high in beta carotene reduces the risk of cancer, therefore taking beta carotene supplements must also reduce the risk of cancer. Studies (and if you want to know which ones, call Shore) have shown that this is untrue and in some cases the opposite is true. I see this at the root of much of the defensiveness about BBS. Some time ago, the National Safety Council did research that showed that upwards of 90% of all injuries had some behavioral element. That study was quickly accepted as gospel and entrepreneurs just as quickly set out to develop solutions based on the fact that 90% of all injuries were caused by unsafe behaviors; this is causefusion—the initial research made no claim to causation; scare few research finding do, rather the study only showed a correlation, i.e. a relationship between two factors. Shore argues that cause fusion tends to make a single cause that is easy to explain (for example, unsafe behavior) appealing when the reality is that the cause is systemic and complex. In support of his argument, he quotes Harvard paleontologist and essayist, Stephen Jay Gould. In the 1990s Gould warned against the new belief that genetics could explain everything. “We naturally favor, and tend to overextend exciting novelties in vain hope that they may provide general solutions or panaceas when such contributions really constitute more modest albeit vital pieces of a much complex puzzle.” BBS is hardly a novelty to safety professionals, but it can be to many Operations professionals and I think this is an apt quote. In Why We Make Mistakes: How we Look Without Seeing, Forget Things in Seconds, and Are All Pretty Sure We Are Way Above Average Joseph T. Hallinan argues that our biases shape so much of what we believe and how we decide that the idea of free will is almost doubtful. He argues that we learn so little from our experience because we attribute causation to the wrong things. In other words, we begin to seek out things that support what we already believe rather than trying to learn new things. On the other hand, in The Human Brain Book An Illustrated Guide To Its Structure, Function, and Disorders Rita Carter points out that while phrenology (the study of personality by studying the bumps on people’s head) has long been ridiculed as quackery and lobotomies (damaging or removing portions of the frontal lobe of people suffering from mental disorders) are now regarded as barbaric both practices offered real benefits—phrenology was the first recognition that parts of the brain controlled different things, and U.K. studies of people who had lobotomies showed that 41% of those who had lobotomies were either cured or greatly improved while only 4% were judged to be worse off then before the procedure. This feeds and supports that our biases tend to impede our judgment (I admit, not exactly an earth-shattering revelation). Many elements within BBS are valuable, but as BBS fanatics continue to dismiss criticisms we run the serious risk that the valuable elements will lost as more and more organizations see BBS as the new phrenology/lobotomy. As long as people keep defending BBS as the single greatest approach to worker safety—without allowing for the fact that there may be a better way, or at very least a cheaper and less complex way of achieving the same results. Did you enjoy this blog? Did you find it thought provoking? Why not share it on Facebook, Twitter, or LinkedIn or by sending it to friends and colleagues via email. I would sure appreciated it and I’m sure they would too. Good morning Phil I hope all is well. The argument for and against Behavior-Based Safety is as old as the first implemented methodologies, yet it still persists in many different beneficial and strange forms. Some refer to incentive schemes as BBS, others just a psychology-based approach as BBS and others watch a video, read an article and attempt to make it work with widely ranging results on culture and performance. I believe BBS to be a situationally-appropriate tool for a small aspect of safety. Moreover, it should be a tool focused on better understanding performance and the influences on it, than an awareness or accountability mechanism. The latter tends to cause some of the problems you write about and I have seen as well. Rather than perpetuating the continuous critique, I would sincerely be interested in reviewing the specifics of the methodology/approach/tool you propose that will accomplish the same results in the small aspect of safety BBS benefits. Would you please share? An excellent suggestion that I think is too large for this (or the LinkedIn forums). I would like to address it in next week’s post. Thank you sincerely for the suggestion, I think it is an excellent one. Thanks for reading and thanks for your comment. Great thought provoking blog. We strive toward being sucessful in our company but I see repeated or same type accidents or near misses regularly. Trends can be recognized and occurrence of the situations seem to come in groups of three. Over the past twenty years, I have witnessed this time and again. This drives me to think then I get a headache. There is no doubt that behaviors are driven not only by our understanding of the work but the attitude of how then work is approached and the attitude we have toward our coworkers. Keep writing, learning from others is never boring. In the early 1980’s, I had BBS “done to me” while an hourly technician with a Fortune 100 company. I hated it. It was the dumbest thing I had ever seen and got in the way of a grown man doing work. The intent was good. The methodology was awkward, pretentious, focused on symptoms rather than causes and was administratively cumbersome. I was a major influence in making a mockery of the system then in place. What better punishment for me than to eventually have accountability for safety and BBS at that site. Then if that wasn’t enough, I wound up owning BBS for the corporation. In order to survive, I created a systems thinking process building on all the good work that has gone on before I came along. My process meets the original intent of BBS (solves problems at the roo-cause level). I simply created a process that kept all the good intent and threw out all the things that made me a detractor. It works fast. It works effectively and involves the right people. And, you may never have to do an observation or build a useless trend. 1. Behaviors are symptoms of deeper-level root causes. 2. The behaviors we discover during incident investigations are not isolated behavioral choices but usually practices and habits. These practices and habits can be reported in an environment free of fear. 3. Employee reported practices are immediately actionable trends. 5. Ask those same employees who are performing in the same area or have the same function, to rank those practices in terms of frequency, severity and probability. 6. Ask one or more of those employees to take the lead in identifying and solving the root-cause that influences this risk-taking behavior. Support the effort with time, guidance, appropriate degrees of freedom and resources. The outcome: Employees are always working on their highest priority and in doing so are much more likely to be energized and involved. Obviously, not every detail is identified but its just that simple. Reading your blog is going to overload my already-aching-for-relief bookshelves (a positive benefit, to be sure)! I’ve always been a huge proponent of Hanlon’s Razor – Never attribute to malice something that can be adequately explained by ignorance of stupidity. Usually, when someone is a fanatic of any issue (BBS) and unwilling to embrace alternatives or open their mind a small, wee bit, I apply Hanlon’s Razor and their view begins to make more sense. Perhaps this is my own instance of Shore’s causefusion, but I would rather think that most folks just do not have it in their heart to act maliciously. That’s the bias that impedes my judgement. My grammar error – “ignorance OR stupidity”, not ‘of’. Wonderful! I couldn’t agree more.